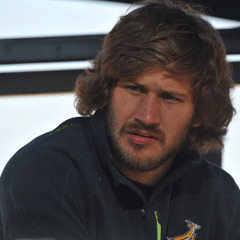 Cape Town - It would have made great sense to the rugby fraternity, for the record, had Frans Steyn been able to schedule his wedding day for June 30. That is the first Saturday after completion of the three-week Test “window” period and one which features a return to slightly lower-tier Super Rugby activity ... not only that, but the team Steyn recently re-signed for, the Sharks, happens to have a bye. Not if you are Francois Philippus Lodewyk Steyn who -- we quietly and slightly belatedly learnt from SARU after the second Test against England on Saturday -- has his nuptials this weekend instead, smack when the final Test of the series is staged in Port Elizabeth. Of course there is a very powerful case for saying that rugby is just another daft ball game, and marriage (with its accompanying, sometimes delicate logistics, let’s not forget) certainly counts as one key element of the infinitely bigger picture of life itself. Mind you, I can imagine many a professional player in the South African landscape and beyond who might have made at least a cursory examination of the IRB schedules – available well, well in advance these days – before pinpointing a date for a wedding, steering clear of certain, obvious red-letter rugby days. Of course so many sports are virtually year-round pursuits nowadays, but there used to be an old, unwritten “rule” or at least phenomenon, if you like, that prominent cricketers tied the knot in the winter and rugby players the summer. We are told that the utility back did alert new Bok coach Heyneke Meyer as to his marital intentions before this series began, so that’s fair enough. And the object of this piece is not to cast judgment on the wisdom of Steyn’s itinerary: I hope I don’t do that at all, actually. What I will do is venture that a hullabaloo of some magnitude might well have broken out had England’s tenacious fightback at Coca-Cola Park ended in a series-levelling win and the teams instead gone to Port Elizabeth with everything to play for ... and then news of vital string-puller Steyn’s absence for the decider, hello, suddenly come to public light! Thank goodness, from a South African perspective, that this weekend instead sees a dead-rubber affair, whatever the levels of home-team hunger to secure a clean sweep. I’m also going to suggest that, regardless of their rights or wrongs in a timing sense, the 25-year-old Grey College product’s nuptials are an extension of a certain single-mindedness we all know Frans Steyn to possess. It’s just something that comes with his rugby package, and for the most part I happen to feel it is something worth celebrating rather than denouncing. They say you can’t and shouldn’t try to bottle free spirits, and Steyn is a fine case in point. He reminds me a little of Michael du Plessis in that respect, another versatile, massively talented and unpredictable character from an earlier Springbok era ... even if I submit that Steyn has relatively little of the hot-tempered streak that characterised Du Plessis who, intriguingly, also went through periods of notably extravagant facial hair. Carefully managed, coaches would largely get what they wanted out of Michael, one of a large stable of rugby-starring Du Plessis brothers mostly associated with a golden period in Western Province’s history. I suspect there are similarities with Steyn, and perhaps okaying his wedding intentions was an early, shrewd bit of diplomacy by Meyer, whatever his own inner feelings about the matter. Minus exposure to the Bok inner circle I could be wrong here, but I am inclined to believe that there is no significant element of dislike or animosity toward Steyn -- whose urgency and industry between the white lines for the Boks is desperately seldom open to question -- from national team-mates. Discerning ones, I reckon, value him for exactly the assured, singular personality he is, and that little “something different” he always seems to weigh in with. Steyn’s never really done things by convention - including making a decision, still aged only 21, to commit himself to Racing Metro in the French league for what would be three lucrative years (thought to be worth well over R7-million per season). They say French rugby, with its apparently lesser conditioning requirements and the like, can offer the risk of southern hemisphere-hailing players falling off the pace a tad. He might have come home last year, ahead of the World Cup, looking more than a little lumpy around the midriff, but it did not prevent him being an outstanding success at inside centre until his injury, and in the current England series he has been as pivotal as anyone, I reckon, in Goal One of safely wrapping up the spoils ahead of the third Test. Indeed, with England dramatically back in the Johannesburg encounter at 31-27 with some 10 minutes left, and play fluid and volatile, Steyn made a critical intervention as Ben Foden and several other attackers surged toward the Bok quarter, plucking the fullback’s attempted chip-ahead from well above his considerable frame and booting the ball back into their half at a time when a further English try looked about 60 percent “on” to my mind. Phew, blushes-sparing job outstandingly done by the Boks’ own, usefully redeployed fullback in the second half. So perhaps you’ll be inclined to join me in simply saying, regardless of your thoughts on his diary planning: “All the best for this Saturday, Fransie”.